The lira’s tailspin has unsettled global markets, with shares of European banks coming under particular pressure because of concerns over the lenders’ exposure to Turkey. The jitters have also hit the currencies of other major emerging markets, such as South Africa and India. On Monday, stocks fell 2% in Tokyo and more than 1% in Hong Kong. Major European markets were down around 0.5%, with shares in banks including Spain’s BBVA and Italy’s Unicredit (UNCFF) sliding 3%. Turkish President Recep Tayyip Erdogan has dismissed calls for the country to raise interest rates to try to ease the crisis — and has lashed out at the United States after it announced new trade tariffs on Turkey. “You are a strategic partner in NATO and on the other hand you stab your ally in the back? Is this acceptable?” he said in a speech Monday. Economists are warning that if confidence isn’t restored quickly, Turkey could lurch into a recession and debt crisis requiring a bailout from the International Monetary Fund. “Investors are clearly concerned that Turkey’s government won’t act (or allow the central bank to act) to shore up the currency, and fears are mounting that this could result in a crisis in Turkey’s banking sector,” William Jackson, chief emerging markets economist at research firm Capital Economics, wrote in a note to clients Friday. The lira is now down more than 40% against the dollar since the start of the year, making it far harder for Turkish companies to pay back loans they have taken out in the US currency. Meanwhile, the US government is using the lira crisis to ramp up pressure on Turkey over its detention of an American pastor. The Turkish government has so far struggled to soothe investors’ concerns. Finance Minister Berat Albayrak said in a series of tweets late Sunday that the government had started introducing an economic action plan of “necessary measures” to address the situation. Albayrak, who is Erdogan’s son-in-law, didn’t provide much in the way of details. The central bank then announced in a statement early Monday that it would “take all necessary measures to maintain financial stability” and “provide all the liquidity the banks need.” It also saidit would slash the amount of funds that banks are required to hold in reserve. The Turkish currency erased some of its earlier losses, but the announcements weren’t enough to trigger a rally. The lira was down around 7% against the dollar in afternoon trading in Europe. Investors are waiting for “a convincing response from the central bank and government,” Rob Carnell, an economist at investment bank ING, said in a note to clients Monday. One dollar now buys a little under seven lira, compared with fewer than four at the start of the year. Murat Askanat, a toy seller in Istanbul, told CNN that rising prices were making it harder to do business. Turkish leaders have insisted that the lira’s crash is the result of a speculative attack rather than any real problems in the country’s economy. Turkish authorities said Monday that they were investigating 346 social media accounts that they accused of provoking the wild movements in the currency, according to the state news agency. The “law will be applied to those who release fake news about banks, financial institutions and companies that are open to the public,” the Turkish Capital Markets Board said in a statement. But investors are more concerned about the lack of strong action by the central bank, which stunned markets late last month by leaving interest rates unchanged. Many observers interpreted the unorthodox decision as a sign Erdogan, who supports lower interest rates, had increased his influence over the bank. Investors have flocked to the United States in recent months, drawn by rising bond yields and a stronger dollar as the Federal Reserve continues to gradually increase interest rates. The trend has set off turmoil in emerging markets: Argentina was forced in June to ask the International Monetary Fund for a $50 billion bailout. Turkey’s plight has raised fears of more casualties. The South African rand plummeted as much as 8% against the dollar early Monday before recovering to trade down more than 2%. 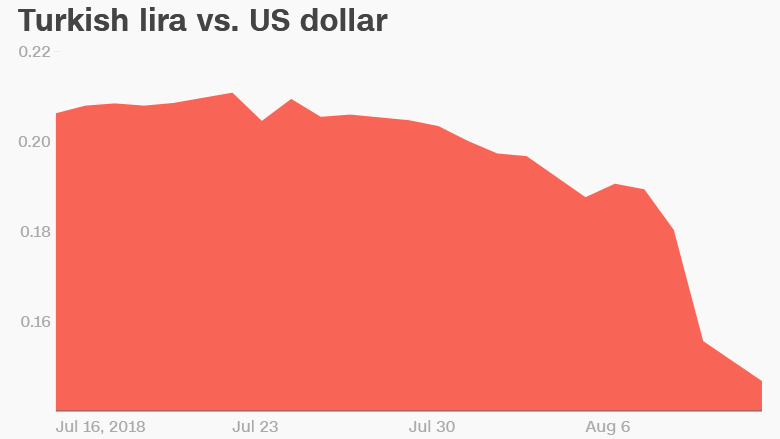 India’s rupee lost around 1% against the dollar, touching a record low. But some market analysts are advising investors against abandoning emerging markets in general as result of the turbulence in Turkey.